Not many institutions from the Occupation of Germany still exist, but I visited one of the last ones recently. It’s still called Die Brücke, the Bridge. This one in Düsseldorf. The building includes the International English Library and the Volkshochschule (a bit like a community college). Sixty years ago, the British opened ten institutes for literature and the arts in cities across their Zone. They wanted to build a cultural bridge between the victors and the defeated. The Germans, so starved for world culture under the Nazis, had access to international periodicals, music and dance performances, literature and lectures. I never guessed how important this issue was until I read postwar German newspapers. Cultural events were listed, many more than I thought there could be in bombed-out cities. In one collection of postwar memories, a returning soldier wrote about attending a lecture about the Italian Renaissance. It was standing room only in the lecture hall, and the listeners came from all walks of German life. The International English Library in Düsseldorf’s website quotes Günther Grass’ famous novel Tin Drum to show how important these institutions were to the Germans. 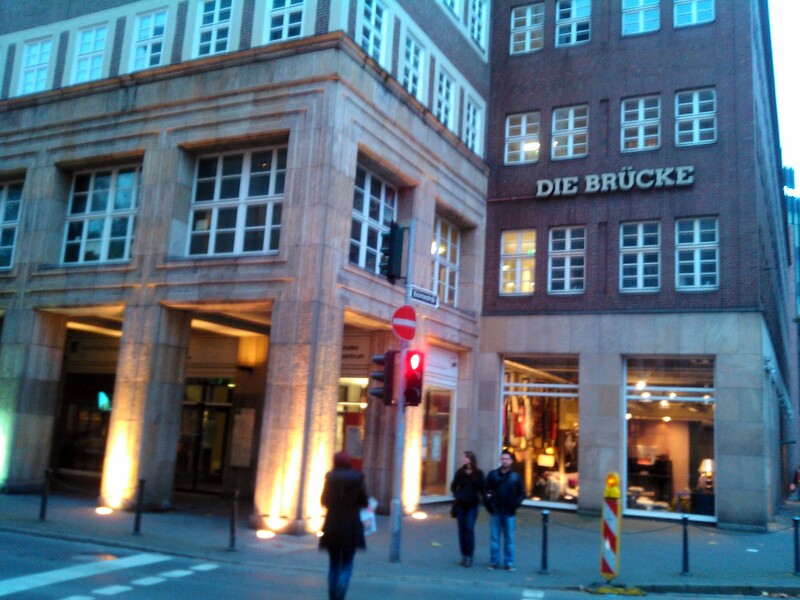 …in those years I educated myself almost free of cost together with thousands wanting to catch up and to educate themselves, took courses in the Volkshochschule, and became a regular in the British Centre, called ‘Die Brücke’. Most of these centers closed down after Germany recovered its ability to provide its own cultural institutions. The few that survive depend on volunteers, membership and donors. For me, the International English Library was a cozy place on the fourth floor of the building (the elevator, though, looked like it hadn’t been serviced since the postwar years). The library isn’t big or flashy, but for a native English speaker starved for a place to browse in her own language, it was perfect. The staff spoke in German or English, sometimes switching from one sentence to the next. The accents were British, American and German. The international conversation added to the unique feel of the library. Language, as well as books, builds bridges.